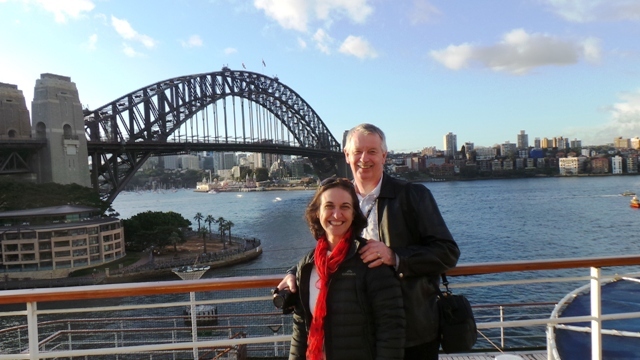 This is the first time Garry and I have cruised on P & O Australia. 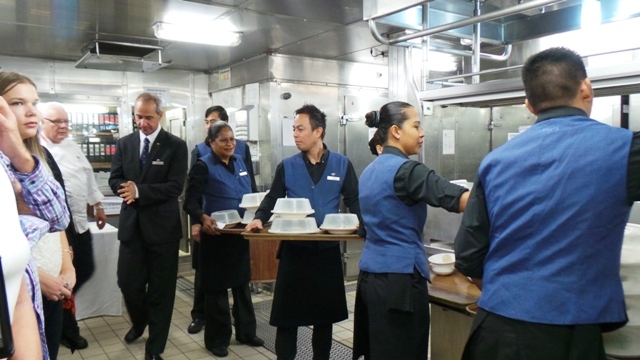 Always thinking that this cruise line may not be the best fit for us, we have avoided them. But an offer came up, so we took it. It would be really unfair to compare P & O with Princess based on this cruise as I have been told, as on any line, short cruises aren’t really an indication of what happens on normal cruises. 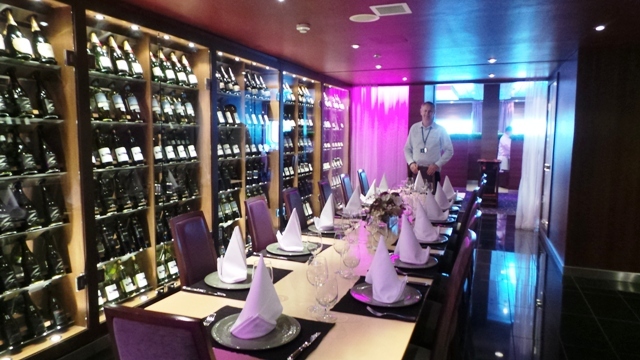 This particular cruise was themed as a Food and Wine Experience. 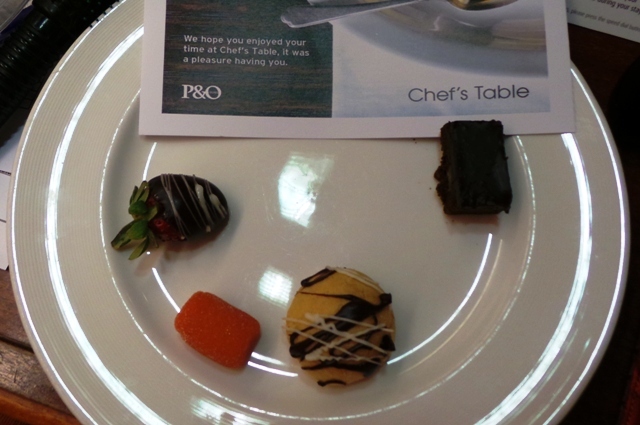 Onboard they brought on several different food and wine lecturers. 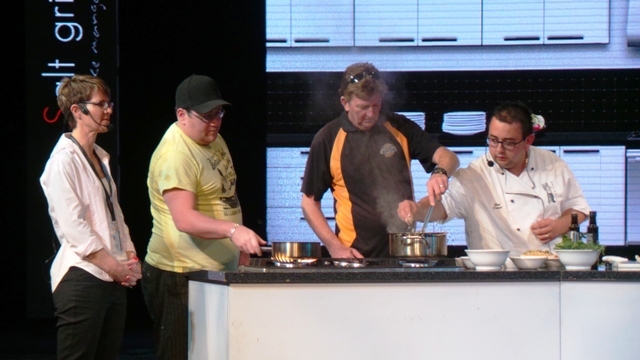 There was a program of demonstrations and tastings throughout the cruise. Intercruises would have done a better job. Ha Ha Ha … only joking. I am bias as that is the company I work for when checking in for RCL and Celebrity. Though it was nice to see so many familiar faces, as there are those who work for both companies. P & O do not have priority boarding ( only for suites I hear ) so everyone queues up together . 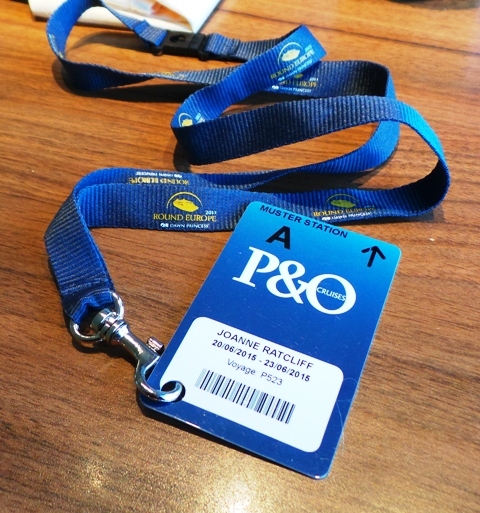 Actually P & O don’t have any sort of loyalty program but funnily enough our P& O personalizer has us linked to our Princess Captains Circle number. 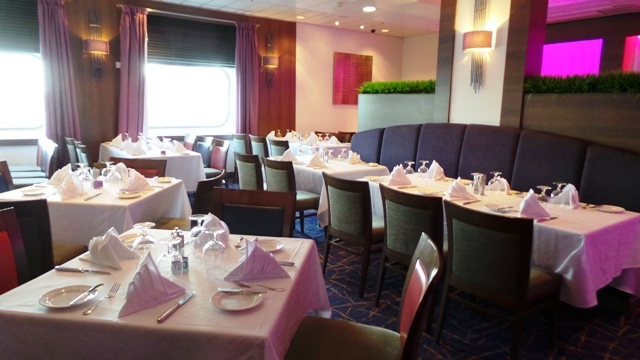 I have also noted that our 3 days have already been added to our days at sea on the Princess Website. Once on the ship we were able to drop our bags off in our Cabin and then head straight up for lunch at the Plantation Buffet. Lets face it, she is an old ship, first being launched in 1988. Sitmar built her, then she was sold to Princess and became the Star Princess. 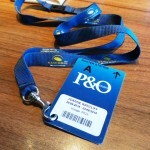 She also served as the Arcadia for P & O UK and eventually became one of the Ocean Village ships. 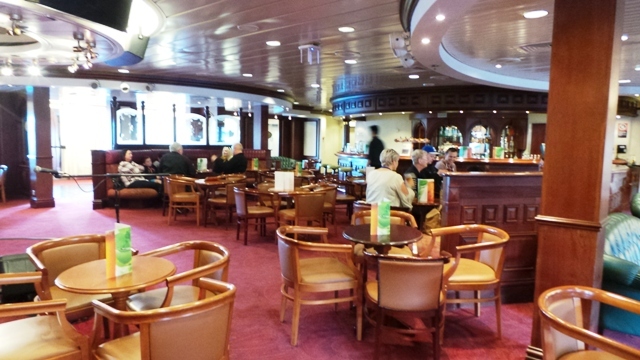 After extensive remodelling in 2010 she became the Pacific Pearl. In her 27 years her exterior is starting to show it’s age. Although her interior is fairly modern looking you can tell she is an old design as she seems dark and pokey inside, especially in the atrium area. When we first walked into our cabin I was drawn towards this shining light. Unfamiliar with it I approached it with some caution. As I walked closer I had to shade my eyes then suddenly I came to the realization that I was standing in front of a window. Omg what a treat we had an outside cabin. 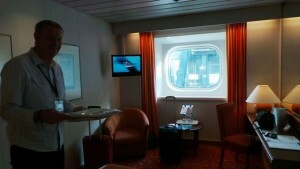 Now this is where P & O win big time the size and layout of the cabin was fantastic. I have been in smaller hotel rooms. 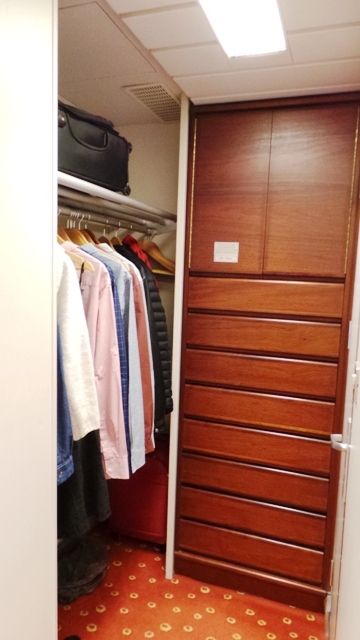 There is lots of storage with an abundance of drawers and you hang your clothes in what seems like a walk in wardrobe. 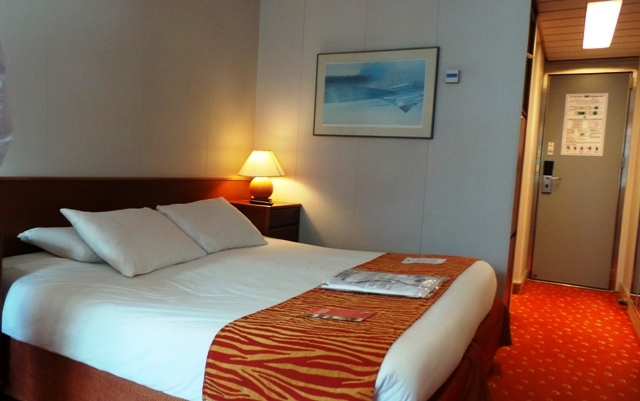 The bathroom is right there… No climbing over someone sitting at the desk to brush your teeth on this ship. There is also a large desk, tub chair, fridge, safe and TV. Get rid of the rust from around the window, spruce up the bathroom and they have a real winner here. 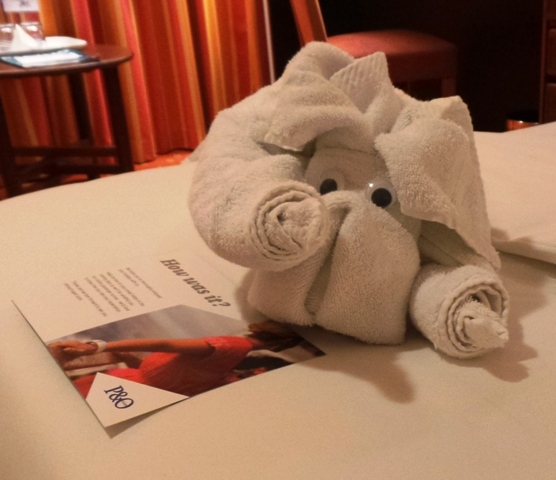 It would also be remiss of me not mention our room steward Arnold. Greeted us by name as soon as we arrived and every time after that when we passed him in the hall way. The deck area upstairs seemed a bit small when we first entered, then we realised that it is actually in two sections. For the first two days the pools were netted, not just because of the cold but the movement of ship which created some great water sprays. There was a sail away party up on deck that went on a lot longer than others we have been to. 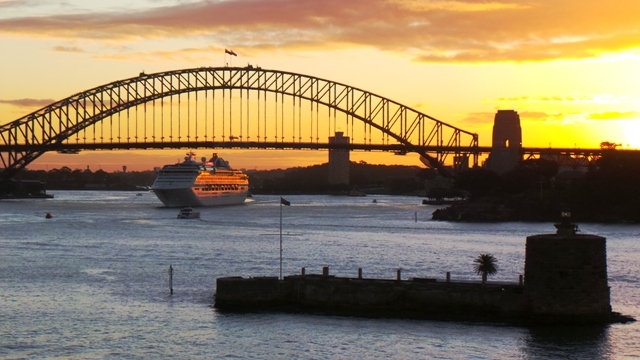 We spent most our sail away on the back decks as the sun was setting behind the harbour bridge and it was too beautiful to leave. Then to our excitement out popped the Sun Princess from White Bay which made it all that more special as we are cruising on her next year. It was probably day 2 before we even knew who the Cruise Director was. Nowhere on any of the paperwork did it introduce her , not even the daily newsletter. I spotted Zoltina and only knew it was her by her hair. What little we did see of her we were impressed. Each night there was a show in the theatre. Unfortunately we missed the first production show “Velvet Rope”, but we made it to the second show “Can’t Stop the Music”. The show was excellent, colourful, energetic and non stop. Garry had us sitting in the front row so it felt like they were looking straight at you whilst they were singing. 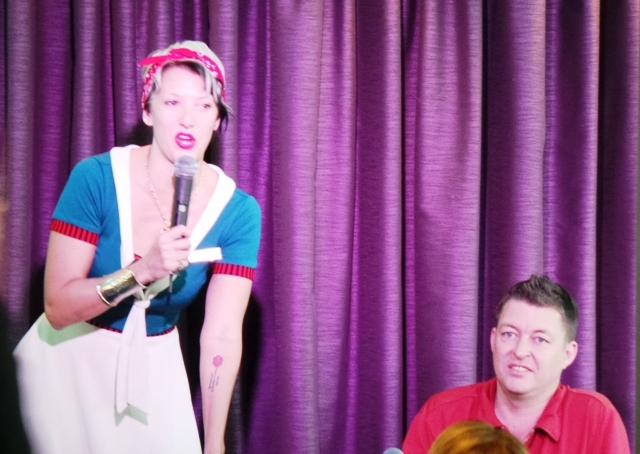 I am believer that stand up comics on ships tend to struggle after 30 minutes and when the topic turned into an explicit description of a colonic procedure, it was no longer funny but repulsive, lucky it was the end as I wanted to keep my dinner down. We didn’t get to the second comedian show .. not because we were offended, we didn’t leave the dinning room till late! 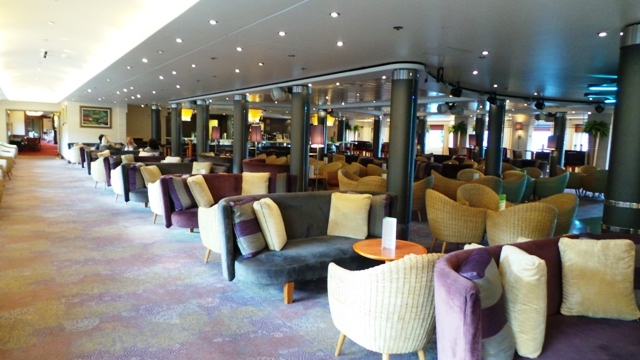 There are a plethora of bars on the ship to choose from. For something quiet you could sit in the Mix or Charlie’s bar. If you wanted the pub experience you went to Connexions or the Orient. Both these areas seem really comfortable …. well, as long as there is no one else there. 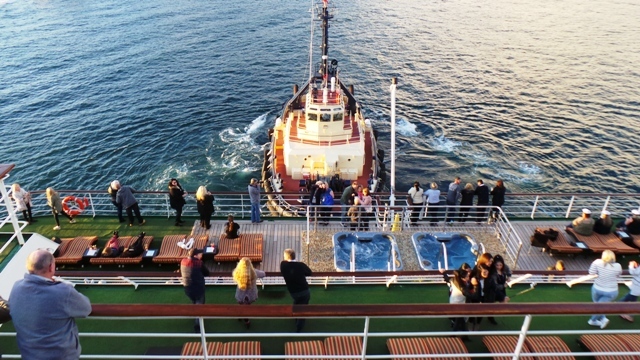 Short cruises attract big groups so both these venues became very noisy at night and impossible to find a seat. Yep, if it wasn’t for the ocean views you could have been at the Mean Fiddler or the local RSL on a Friday night. 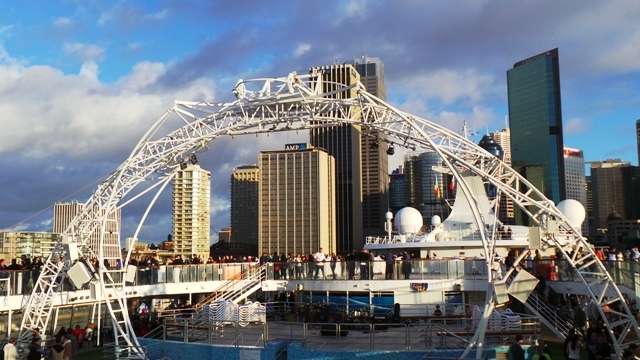 During the day it was where they held trivia and other cruise ship games. Plantation Buffet – We really didn’t find this a comfortable place to eat. The ceilings are very low and even though there are large windows all the way around it is very dark. 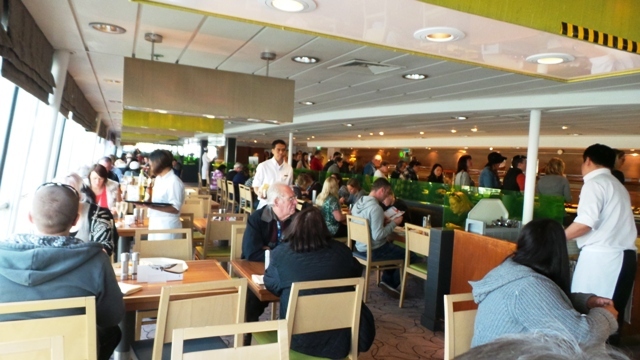 After fighting the crowds at lunch on embarkation we didn’t visit there again until breakfast on the morning of disembarkation. 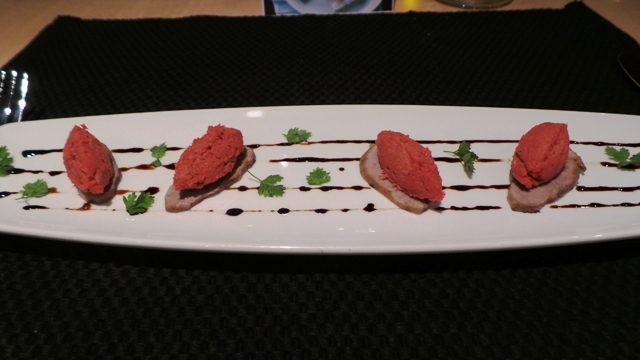 The food was very nice and the service was ok.. 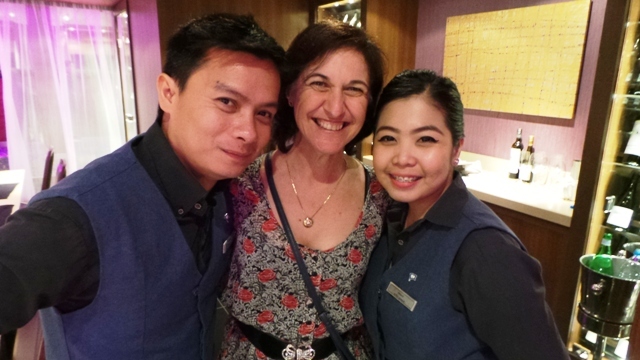 But the biggest disappointment was that over the three days at no time did any of the waiters introduced themselves or offer any sort of the personalised service that we are used to from other lines. Again maybe it is a three day cruise thing. 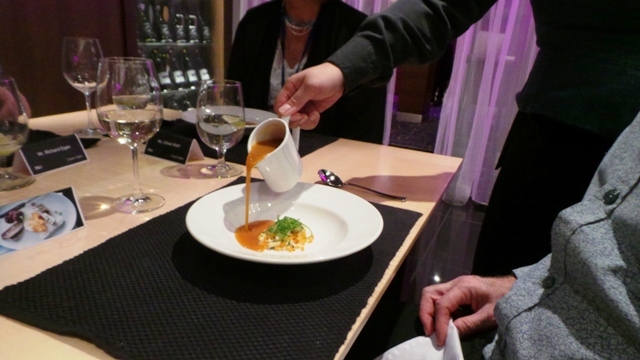 Specialty Restaurants – We didn’t do any of the speciality restaurants, we were saving ourselves for the Chefs Table. 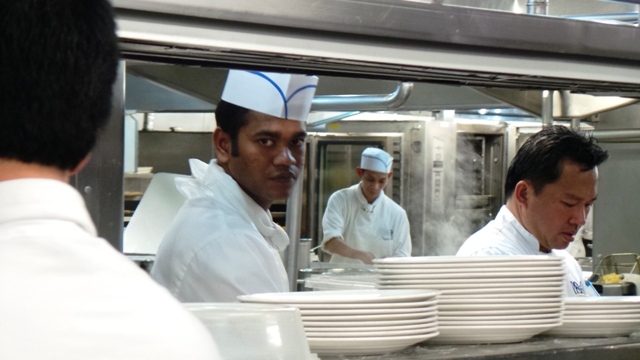 Chefs Table – After doing the Chefs table last year on the Ocean Princess we were keen to try it on P & O. On this ship they have a room specially reserved for it. Beautifully decorated a table large enough to seat 14 people sits in the middle with the surrounding walls filled from floor to ceiling with bottles of wine. Knowing that this event is limited and books out very quickly, we went to the Waterfront Restaurant as soon as we boarded to book. The Maitre’ d took our names but couldn’t guarantee that it would go ahead. Normally it is not held on the short cruises. “But” he said ” It might be, the chef’s in a good mood this weekend ” . 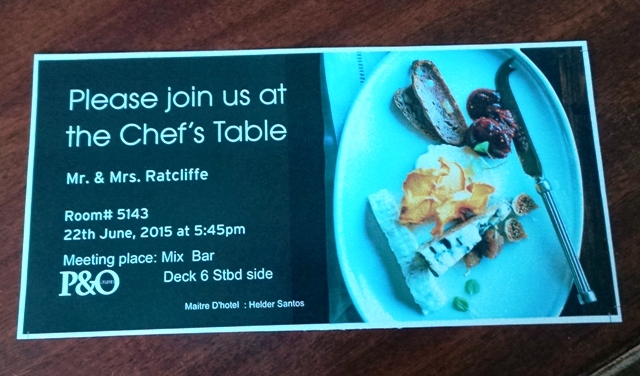 The cost is $95 per person so we held off booking any of the other restaurants. We kept our fingers crossed that we wouldn’t miss out … Yay we found our invitation in our cabin on the Sunday for Monday night. They had us meet in the Mix Bar. We were served three different types of starters. A delicious prawn and Mango Bruscetta, yummy cheese with prosciutto and smoked salmon with capers which I ate really quickly. 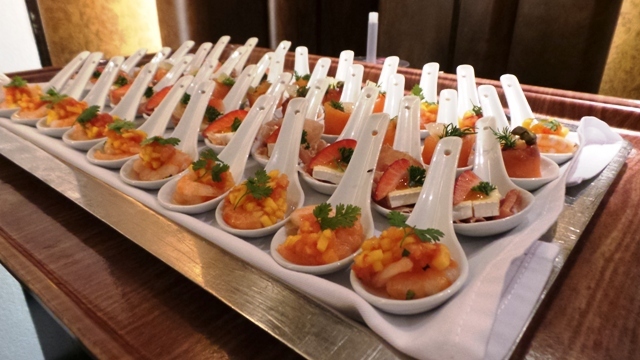 I am not a fan of raw fish… Lucky there was oodles of Champagne to wash it down with. 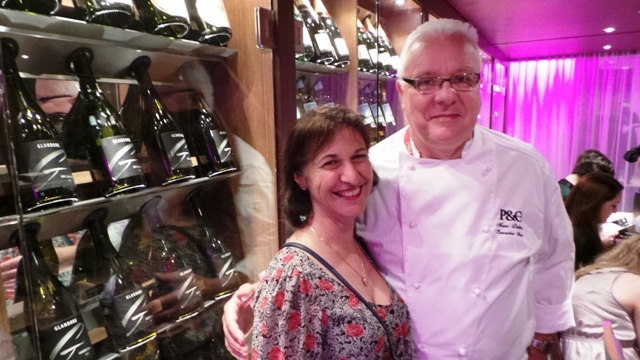 From there we were walked down through the Galley and were introduced to the Head Chef Marc, gorgeous French accent. He gave us a quick tour and then on to our special room. Here he explained that all the menus and recipes are decided by head office and that is what is served in the restaurants… But the Chef’s table is all about him and his choice and what can I say what excellent taste he has. Then it was time to clean the palette which is done no better way, but with a vodka and citrus sorbet. 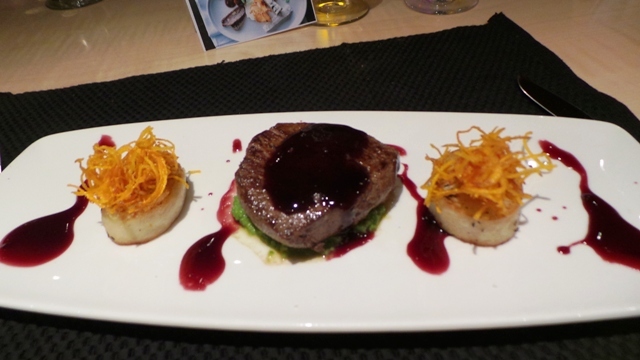 Mains was the most tenderest piece of beef loin. Thick, juicy and mooing… just the way we like it.. Did I mention that with every course our wine glasses were filled with different wines from all parts of Australia. 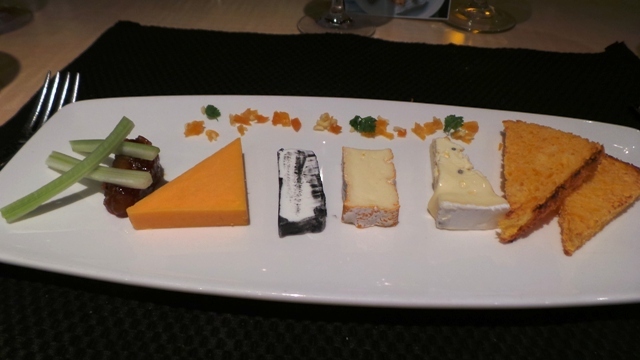 Now, where did I get up to … ah yes then there was cheese … a selection that was beautifully presented. Last but not least came the variation of mango’s complimented with a glass of Botrytis Semillon. 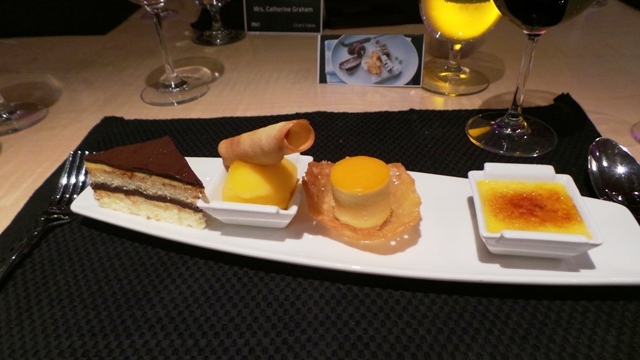 Mango like you have never seen before, Mango Opera Cake, Mango Icecream, Mango Mousse and my favourite Mango Creme Brulee . By now we are rolling down towards the cabin… and just when we thought it was over we walked in to find a thankyou note and more after dinner pleasures. 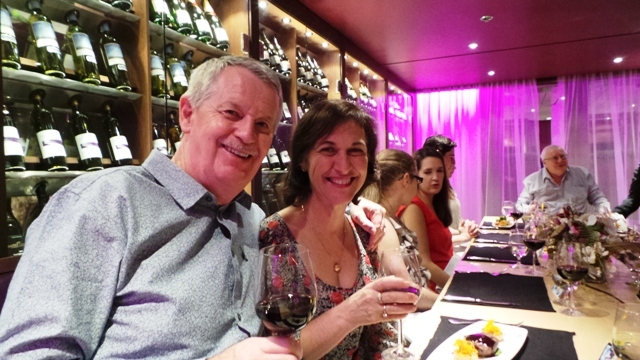 Tonight brought back memories from our River Cruise as the food was on par with that. We have to say this was the highlight of the cruise for us. 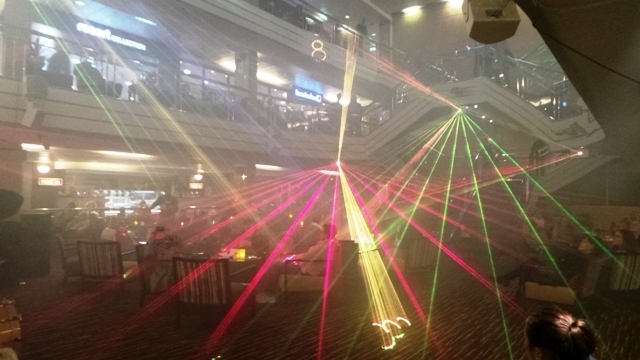 This was a themed cruise so over the three days there was a variety of events that you could attend. The lectures and demonstrations were free but the tastings had a small cover charge. We stuck to the lectures and left the tastings, which were all based around alcohol for the youngens. 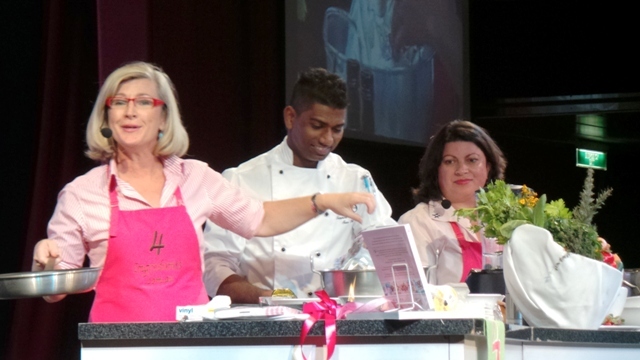 Our favourite was Kim McCosker from the 4 Ingredient cook book fame. Not only can she write books but she can entertain too. 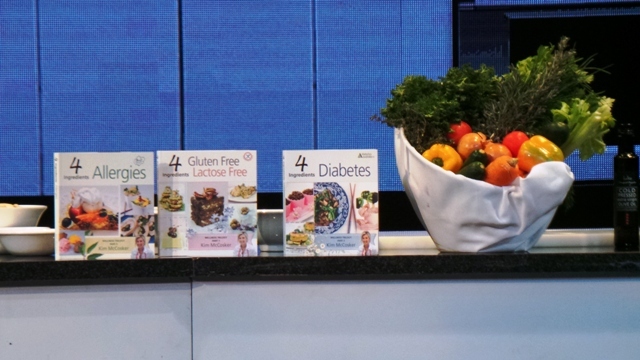 She had us laughing and salivating all at the same time and she probably was one of the biggest draw cards..
Daniel Abou – Chedid gave us a quick back to basics cooking class. 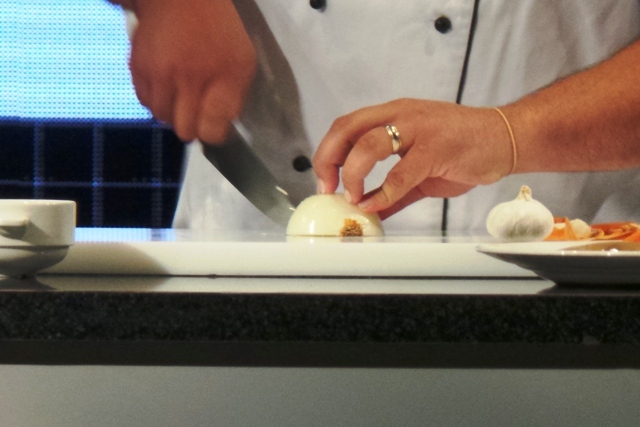 From how to hold your knife, dice an onion and how to keep your cooking simple but tasty. Mix Academy, which I assume was cocktail mixing. Whisky and Tequila Tasting… luckily these were all after lunch. This was easy as we only had carry on luggage with us. We were naughty and didn’t go to the meeting place, hey we were on deck 5 and we had to walk straight pass the gangway to get there … so we just joined the queue and walked off when we were ready. 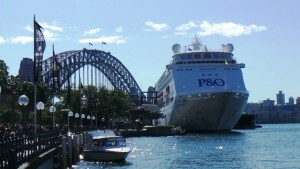 So over all we enjoyed our time on the Pacific Pearl and with P & O. 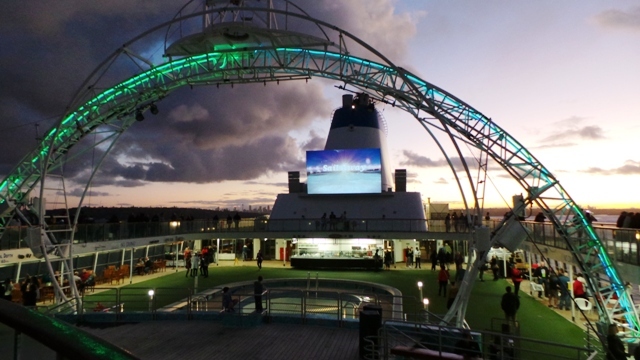 If there was an itinerary that appealed we would cruise with them again. Short cruises …. well maybe we will stick to the longer ones that at least have a port.